I have a new gig. A real, full-time, desk-sitting, time-sheeting gig. For two months now I’ve been program manager at Gorman House Arts Centre and Ainslie Art Centre in Braddon. As with most artistically minded Canberrans Gorman House has played a big role in my life, and I’m so excited to be able to help the organisation through a period of renewal and reconnection with its original purpose. One of the most excellent things about being at an arts centre is that I can continue to have the privilege of working across art forms, because really, it’s not fair to have to choose. There are a whole lot of transformations currently taking place at the centres, and a many great projects in the works. The first of these is coming up very soon, and the writers among you might be keen. 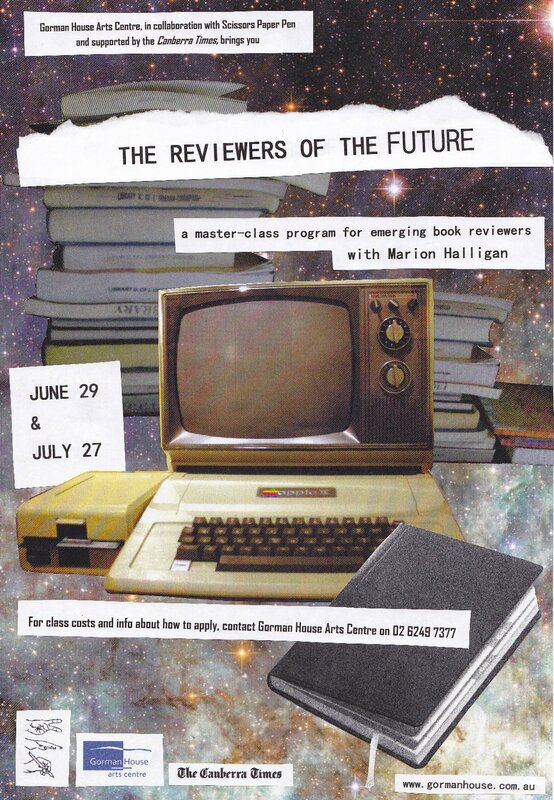 It’s Reviewers of the Future – a masterclass for emerging book reviewers with author Marion Halligan, organised in collaboration with Scissor Paper Pen and supported by the Canberra Times. Although we specifically refer to book reviews I really do think this is going to be insightful for anyone writing (or hoping to write) arts reviews. Take a look and see what you think, but don’t put it off because applications close this coming Thursday June 20. Event poster made by yours truly. I’m a bit proud of what you can achieve when you don’t have access to In Design.